Full of presentations, exhibitions and innovations, the 79th annual Technology Fall Conference will welcome about 500 educators and other professionals to SUNY Oswego Oct. 25 and 26. 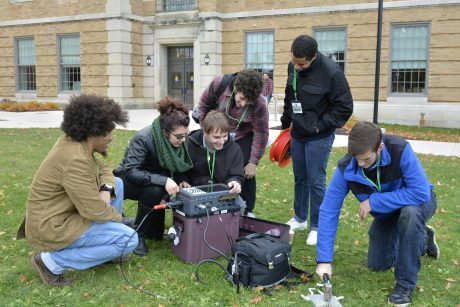 Here, Oswego students demonstrate a seismograph system outside Park Hall during a recent Technology Fall Conference. OSWEGO — Drones, virtual reality headgear, customized logic boards, laser cutters and much more will be part of the 79th annual Technology Fall Conference at SUNY Oswego. A signature event for one of SUNY Oswego’s oldest programs — technology education — the conference will feature the annual Technology Innovation Showcase, 50-plus presentations and workshops, commercial exhibits and a reception. Mark Hardy, the college’s technology department chair, said professional educators and SUNY Oswego students are poised to participate in presentations and in the Technology Innovation Showcase poster session, to take place in the large, glassy technology laboratories for precision manufacturing wood fabrication in Wilber Hall. Technology is not all about high-tech; maker spaces popping up in schools all over the state aren’t all about 3D printers. Kids Tech, a program of the Oswego State Technology Education Association, gives technology education majors the opportunity to work with two elementary aged levels: STEM 4 Kids K-3 and Young Inventors for grades 4-6. Technology education faculty member Mark Springston, programming chair for the conference, said, for example, that 11 SUNY Oswego students enrolled in “Teaching Methods” plan to present in the Technology Innovation Showcase on 16 STEM-based activities they created to engage 44 Oswego County children this semester. In addition, a current student teacher plans to present on an innovative project that he has created for his middle school students. Led by Springston and fellow faculty member Richard Bush, the conference chair, the agenda promises to feature a variety of presentations that will put the “high” in high-tech. The Central New York Drones Association will take part in the Technology Innovation Showcase. There are several robotics presentations on the list. There are “Crystalline Polymer Science,” “Neuroscience in the Classroom” and “Laser Integration” already on the agenda. It might all sound like graduate school, but the educators talking about these advanced subjects — and many more — hail from 700 school districts and charter schools around the state, as well as from companies interested in professional development opportunities for educators. One of those, Forest Scientific Corp., has donated a computer numerical control router and related equipment — a package worth $18,000 — for a drawing that will benefit a middle or high school in New York, Hardy said. “We’re also looking forward to next year, which will be our 80th year for the conference — another huge milestone for us,” he said.